In In Our Suites You Will Find The Comfort In Two Bedrooms & Two Bathrooms. Dominion Corporate Suites prides itself on offering short and extended stays to guests who count on our high-touch, personalized service and extensive hotel amenities. A contemporary environment where space, quality and elegance meet, Dominion Corporate Suites is the ideal choice for those staying on the west side of the city. In addition to being pet-friendly, the property offers covered parking, 24-hour security, complimentary breakfast, indoor pool, fitness center, and free WiFi to ensure a comfortable and productive to stay for executives and families alike. Dominion Corporate Housing is Mexico’s leading extended stay operator and management company. From 1998 Dominion Corporate Housing has been recognized for proving both short and long term housing solutions with an unmatched level of service. After 18 years of getting to know what business and leisure travelers need and look for, Dominion has emerged within the extended stay category as provider of more than just a place to stay. Dominion Corporate Housing has been committed to welcoming its guests like family to ensure they feel totally at home. We provide guests with an unmatched level of service above and beyond ‘just a place to stay’ for (your) their short and long-term visits to Mexico City. 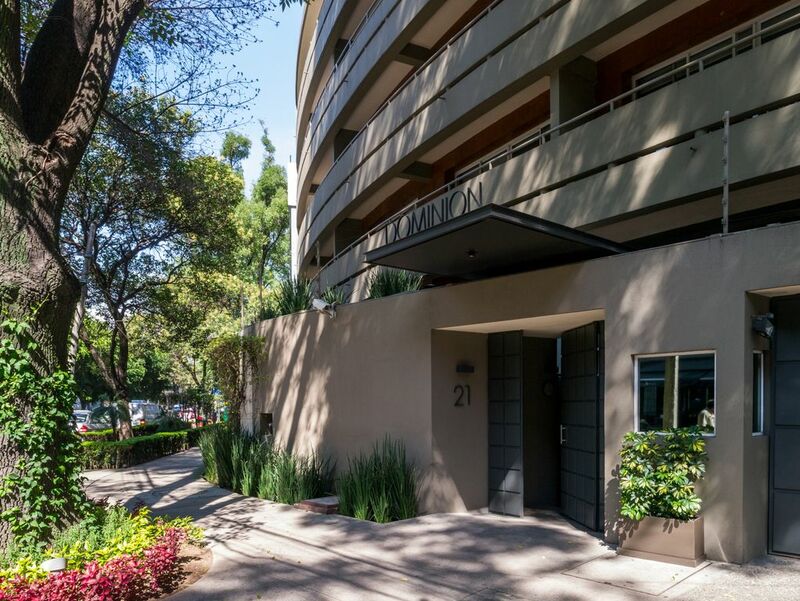 Fantastic property and the very best location in all of CDMX! Our family spent a week here and loved every aspect. The location is so perfect to easily access all of the highlights of CDMX! Great location and immaculate apartment. Close to great restaurants, major hotels and the park. The property was spacious and had all the conveniences you need for an extended stay. The staff were very pleaseant. We had no need to ask anything of the host but he certainly made us feel welcome to do so. Great place, wonderful staff, high quality condo. It was very beautifully designed and spacious. The staff was lovely and extremely helpful. The apartment was beautiful and in a very convenient location for our purposes. There were no kitchen towels. We could have used some. Only the two bedrooms had heat. The rest of the apartment was pretty cold. Overall, the apartment was very dimly lit to the point of depressing. More light would have been much more comfortable. There is no good place to put on make up. The bathroom mirrors are too far away to be of any use. A wall-mounted, swing-away mirror in the bathroom would be a big help. I had to buy a mirror and prop it on books next to a table lamp on a desk in one of the bedrooms. But overall, it was a lovely place to stay and we would happily stay there again. Awesome central safe location. Clean, helpful staff, and nice breakfast. Service is awesome, apartment is large. Front room furniture is tattered though. Location can not be any better. Looks out over beautiful park and surrounding shops and restaurants. The service was awesome. The only negative was that the front room furniture is really detiorated. Dominion Corporate Suites is located in the dynamic and vibrant Polanco district. It houses 24 modern, spacious two-bedroom apartments, each with a living room, fully equipped kitchen, and a private balcony. In addition to being pet-friendly, the property offers covered parking, 24-hour security, indoor pool, fitness center, and free WiFi to ensure a comfortable and productive to stay for executives and families alike.